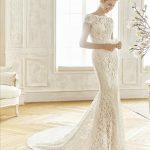 Baena is a beautiful crepe gown, with long illusion sleeves covered in delicate lace. 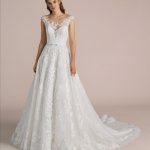 This mermaid silhouette is striking, with attention to detail on the train of the gown where more lace has been positioned beautifully to compliment the lace on the bodice. The high illusion neck and back adds sophistication to the sensual femininity of this gown. COPYRIGHT ©2018, HAGLEY BRIDAL STUDIO. ALL RIGHTS RESERVED.